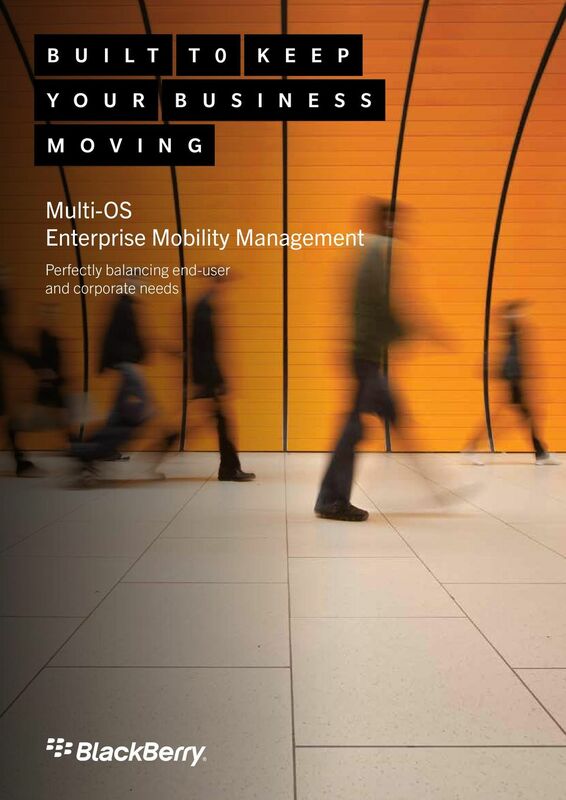 Download "Multi-OS Enterprise Mobility Management. Perfectly balancing end-user and corporate needs"
2 Enterprise mobility enables organizations to transform employee performance, mobilize business processes and deploy apps that improve productivity and enhance customer service. Employees are demanding a choice of devices and apps to use at work, and the growing acceptance of BYOD and personal use on corporate devices means Enterprise Mobility Management (EMM) is now an indispensable element of IT strategy. The need? An EMM solution that embraces today s mobile realities. Unified and proven to address the issues of device and application management and security for multi-platform, multiple device per user environments. The solution is BlackBerry Enterprise Service 10 (BES10). It helps business leaders to create value by empowering employees to be more productive and better equipped to serve customers. BES10 delivers comprehensive multi-platform management for ios, Android and BlackBerry devices. This enables organizations of all sizes to truly mobilize their business by delivering leading experiences across: User experience seamless access to secure corporate data, from company owned and BYOD devices, without restricting users' personal experience and privacy Device management comprehensive management and security controls across platforms from one unified console Information security built-in data leakage prevention (DLP) to isolate and prevent work data from leaking into personal channels App management & security centralized, fast and effective application deployment to a corporate app catalog with seamless management and security Where multiple devices, ownership models, applications and operating environments exist, BlackBerry Enterprise Service 10 perfectly balances end user and corporate needs to keep your business moving. 4 Satisfying both user and corporate needs without compromise Secure Work Space for ios and Android Secure Work Space is a containerization, applicationwrapping and secure connectivity option that delivers a higher level of control and security to ios and Android devices, all managed through the BES10 administration console. Managed applications are secured and separated from personal apps and data, providing an integrated , calendar and contacts app, an enterprise-level secure browser and secure document viewing and editing with Documents To Go. User authentication is required to access secure apps and work data cannot be shared outside the Secure Work Space. The trusted BlackBerry security model provides built-in secure connectivity for all enterprise apps deployed to the Secure Work Space no VPN needed. 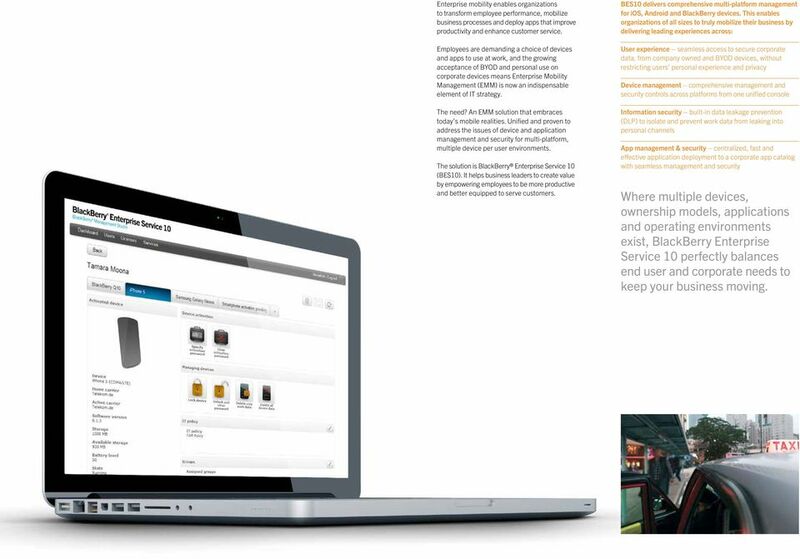 Satisfying both user and corporate needs without compromise BES10 enables the seamless separation of work and personal content on corporate-owned and BYOD devices to satisfy both user and corporate needs without compromising on either. Managed through a single administration console, you can empower mobile employees with easy and secure access to work content such as , documents and intranet, as well as approved apps, without impacting their personal use and privacy. Work data is password protected and secured through a single, secure connectivity model across all managed devices. Data Leakage Prevention (DLP) isolates work content and prevents it from leaking into personal channels. 6 Get BES10 Ready Getting up and running with BES10 is fast and straightforward. Importantly, it works with your existing BlackBerry Enterprise Server infrastructure. Step 1: Download BlackBerry Enterprise Service 10 for free at BES10.com Step 2: Transfer existing BlackBerry Enterprise Server Client Access Licenses (CAL) to BES10 CALs for managing BlackBerry 10 devices at no additional cost. Go to blackberry.com/bes10ready Purchase new BES10 CALs for additional ios, Android and BlackBerry devices from your preferred partner. Step 3: Connect new ios, Android and BlackBerry 10 devices to BES10. You can continue to manage existing BlackBerry OS devices connected to BlackBerry Enterprise Server and above, alongside ios, Android and BlackBerry 10 devices, through the centralized BES10 adminstration console. 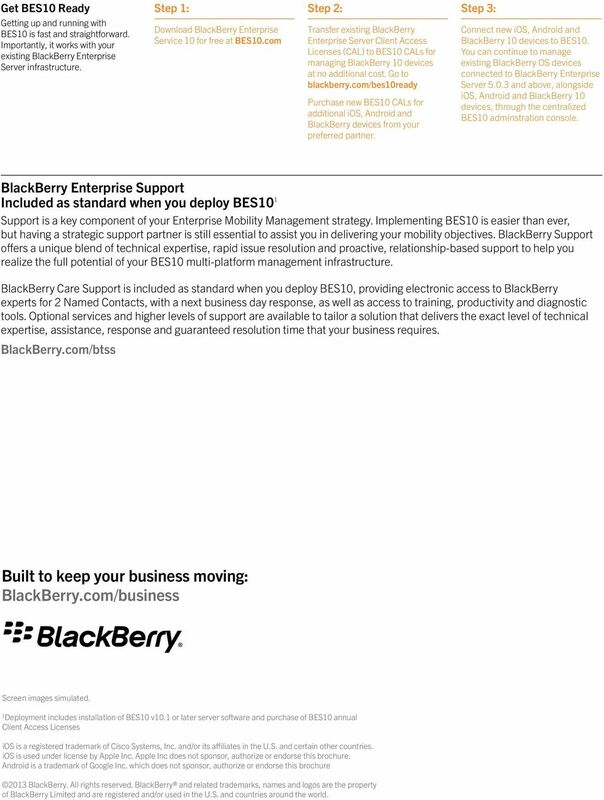 BlackBerry Enterprise Support Included as standard when you deploy BES10 1 Support is a key component of your Enterprise Mobility Management strategy. Implementing BES10 is easier than ever, but having a strategic support partner is still essential to assist you in delivering your mobility objectives. BlackBerry Support offers a unique blend of technical expertise, rapid issue resolution and proactive, relationship-based support to help you realize the full potential of your BES10 multi-platform management infrastructure. BlackBerry Care Support is included as standard when you deploy BES10, providing electronic access to BlackBerry experts for 2 Named Contacts, with a next business day response, as well as access to training, productivity and diagnostic tools. Optional services and higher levels of support are available to tailor a solution that delivers the exact level of technical expertise, assistance, response and guaranteed resolution time that your business requires. BlackBerry.com/btss Built to keep your business moving: Built to keep your business moving: BlackBerry.com/business Screen images simulated. 1 Deployment includes installation of BES10 v10.1 or later server software and purchase of BES10 annual Client Access Licenses ios is a registered trademark of Cisco Systems, Inc. and/or its affiliates in the U.S. and certain other countries. 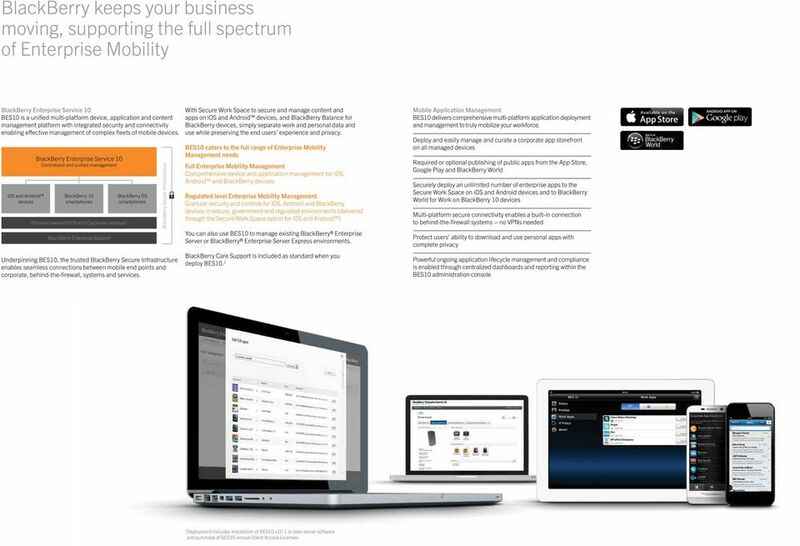 ios is used under license by Apple Inc. Apple Inc does not sponsor, authorize or endorse this brochure. 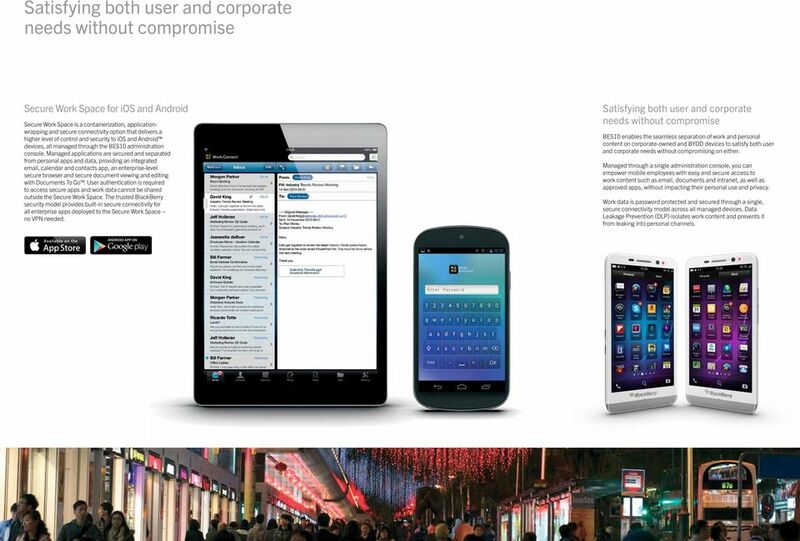 Android is a trademark of Google Inc. which does not sponsor, authorize or endorse this brochure 2013 BlackBerry. All rights reserved. BlackBerry and related trademarks, names and logos are the property of BlackBerry Limited and are registered and/or used in the U.S. and countries around the world. Future Focus: What s Coming in Enterprise Mobility Management (EMM) FUTURE FOCUS. What s Coming in Enterprise Mobility Management. Mobile Access Software Blade Dimension Data BYOD event Jeroen De Corel SE BeLux 2012 Check Point Software Technologies Ltd. [PROTECTED] All rights reserved. 2012 Check Point Software Technologies Ltd.
Data Loss Prevention Whitepaper. When Mobile Device Management Isn t Enough. Your Device Here. Good supports hundreds of devices. GOV.UK Guidance BYOD Guidance: BlackBerry Secure Work Space Published 17 February 2015 Contents 1. About this guidance 2. Summary of key risks 3. Secure Work Space components 4. Technical assessment 5. 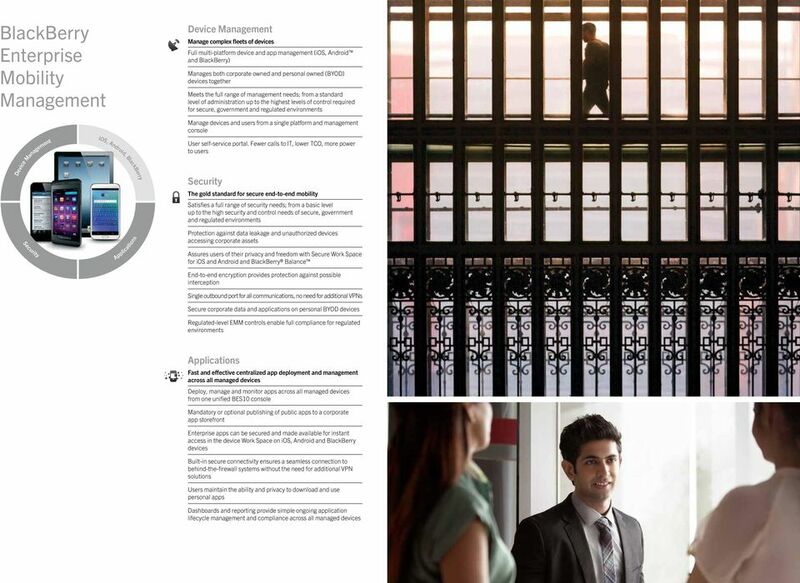 The CIO s Guide to Enterprise Mobility Management THE CIO S GUIDE. To Enterprise Mobility Management. Whitepaper. Whitepaper. Today s Best Practices: How smart business is protecting enterprise data integrity and employee privacy on popular mobile devices. Your Device Here. BEST PRACTICE GUIDE MOBILE DEVICE MANAGEMENT AND MOBILE SECURITY.